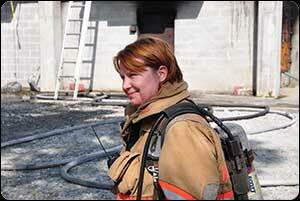 Deputy Chief Jacque Feilke. . .
has served the citizens of Clayton County for years. 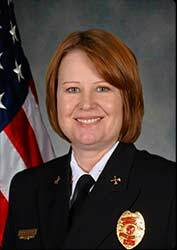 She began her career as a Clayton County Fire & Emergency Services firefighter in 1986 and advanced through the ranks of Sergeant and Lieutenant and becoming a Captain. 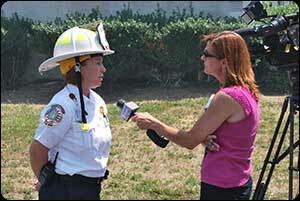 After 24 years of service in the Operations Division she was promoted to Battalion Chief of the department’s newly formed Public Affairs division in 2011, and served as the Public Information Officer. She was later promoted to the rank of Deputy Chief over the CCFES Planning/Training Division where she served until December of 2013. As Deputy Chief of Professional Standards Chief Feilke has now been charged with a new division for the department. Her current responsibilities are to oversee the Department’s Fire & EMS Accreditation, Policy and mandates and revisions, Public Information Officer, recruitment as well as new employee hiring and public affairs. Chief Feilke is a State of Georgia Emergency Medical Technician and Hazardous Materials Technician.